Safety when you are white water rafting is important. Anyone who does not adhere to the basic safety rules is not only endangering their own life but those of others around them. Injuries that could be suffered during an accident when white water rafting include trauma from hitting an object in the water, submersion injuries, traumatic stress or non-environmental injuries. It is also important to take into account any medical conditions suffered by those who are rafting. It depends where you are as to whether or not the safety regulations are actually in legislation. It could be that the wearing of lifejackets is mandatory, for example. While most trip organisers will insist on this anyway, you should check in advance what the regulations are. For those who are going on a trip that has been organised by qualified professionals it is worth asking in advance about the safety measures that are in place. 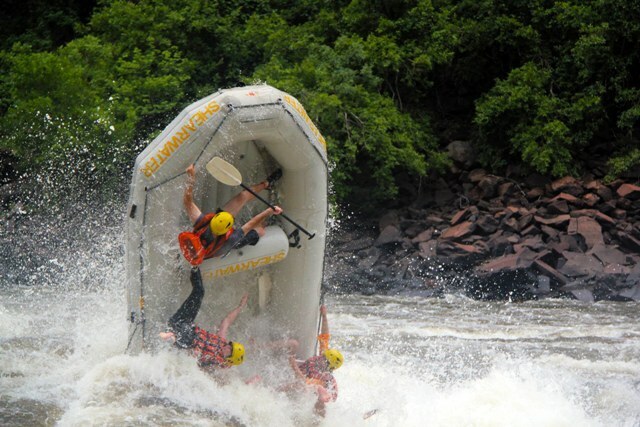 However, rafting has actually become much safer in recent years. The safety equipment has been developed to make it stronger and easier to use and there are more trained experts running the trips. Remember too that the difficulty level on some natural river courses changes throughout the year so the risk levels will change too. One of the main issues with white water rafting is improper behaviour. While the vast majority of people who take part do so very safely, occasionally there will be one person whose actions will endanger others. No-one should take part in a rafting trip while they are under the influence of alcohol, for example, or if they have not undergone basic instruction. A good instructor will make you aware of the risks and how you how to use all the safety equipment. If this does not happen then you need to consider a different instructor.